Before I begin let me make something clear. I love Peter Jackson's "Lord of the Rings" movies. They are probably my favorite movies of all time. But you're not going to be able to tell from this page. Here I intend to nitpick and point out all the little annoying differences. Also, I am writing only about the theatrical version of the movie--I have not seen the Extended Editions. Time--There is a much larger gap between the party and when Frodo leaves the Shire. Crickhollow--Frodo doesn't go to Crickhollow. And we don't see Fatty Bolger. Farmer Maggot--We see him, but we don't see him save the hobbits from the Black Riders. In fact, all we really see of him is his scythe. Tom Bombadil and Goldberry--One of the main criticisms of Tolkien is a lack of women. Peter Jackson and his team tried to build strong female characters. Since that is so, why, why why did they leave out Goldberry? And Tom Bombadil is so delightful! Although this too is a matter of personal taste. Bree--Bree is a much friendlier town than it appears to be in the movies. Yes, the citizens are more distrustful than usual, but not the extent shown. Elrond--I will probably say this for each movie, but Elrond in the book has not given up on Middle-earth the way movie Elrond has. Peter Jackson had textual basis, but he went far beyond what is in the book. Saruman--The wizard battle was a bit over done in my opinon. Yes, the special effects are very neat. We see them. Get on with the story. The Council--We don't really see Elrond's unwillingness to let Merry and Pippin go with the Fellowship. And BIlbo is supposed to be there. Moria--It is Gandalf who wants to go to Moria in the book with Aragorn trying to disuade him. Also, we are not told directly that Saruman is responsible for the storm. Lothlórien--The sense of seige that is present in the book because of the orcs attacking is missing. Also, Galadriel seems just a little too fey; they overdid it a bit. The last is a matter of interpretation and taste. Boromir--He never said that line, "I would have followed you my brother, my captain, my king." But this is a change I like (for once). It is a beautiful line. Faramir--This is probably the biggest change from book to movie in The Two Towers and the change that annoys me most in the entire series. Book Faramir is not tempted by the Ring. "I would not take this thing if it were lying in the highway." (TTT ) Movie Faramir drags Frodo and Sam off to Osgiliath which is totally unnecessary. Besides which, if they had left all that stuff at Osgiliath out they could have shown the Houses of Healing in the third movie and saved quite a few people quite a bit of confusion. The actor was perfect, but the storyline was awful! Helm's Deep--Helm's Deep took nowhere near as long in the book as it did in the movie. And there were no Elves there. (Why there and not at the Battle of Cormallen?) If they had to have Elves there, why kill Haldir? Arwen--We hardly see Arwen in the book and we are not really told what she is doing while Aragorn is away. I suppose this is why Jackson felt free to add a whole subplot where Elrond tries to send her over the Sea. Vaguely annoying, but the resolution was nice. The Palantir--When Pippin finds the Palantir in the movie it is slightly stupid. He just looks down and finds it instead of having Wormtongue throw it at him. Also, in the scene where Pippin looks in the Palantir, Aragorn should be able to handle it since he is the King of Gondor. Theoden--He does not hesitate about going to Gondor's aid. Arwen--Again, one of the few changes that I like. I love how Peter Jackson showed us Eldarion and Aragorn in the future, just as in the Two Towers he shows us what will happen when Aragorn dies. Later, the whole business about the mortal life leaving her is absolutely unneeded. Aragorn already has enough to fight for. Denethor--When Gandalf and Pippin first arrive at Minas Tirith Denethor is not so far gone in madness as it seems. He has not abandoned the defenses nor utterly despaired. Sam and Frodo--Frodo is not so far under the power of the Ring that he would send Sam away and I doubt that Sam would allow him to send him away in any case. What happened to "I made a promise Mr. 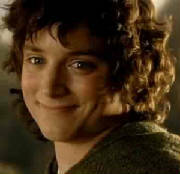 Frodo?" Beacons--Although I love the sequence where Pippin lights the beacons, it doesn't happen quite that way in the book. In the book Denethor is still wary enough to light them and also to send a messanger to Theoden. The Paths of the Dead--Aragorn, Gimli and Legolas go on the Paths of the Dead, but the Rangers, Aragorn's kinsmen, have come and go with them as well. Also, you do not know what has happened until afterwards which adds some suspense that is completely missing in the movie. Anduril--Aragorn already has Anduril. Indeed, he has had it since he left Rivendell. Merry and Eowyn--Merry does not immediately know that "Dernhelm" is Eowyn. Cirith Ungol--Sam is with Frodo and bangs his head and becomes unconsious. Minas Tirith--The women and children have already been evacuated so there is no danger of their being killed. Pelennor Fields--Most of it is accurate, but Elladan and Elrohir, the sons of Elrond, are there as well as at Cormallen Fields. The Tower--Couldn't they have had Sam sing the song that begins "In western lands beneath the sun." It's so beautiful! And the Orc is about to whip Frodo, not kill him. Cormallen Fields--The Rangers and the Elves are there. Frankly, there is no good reason for Peter Jackson leaving them out. Mount Doom--Frodo does not begin to fight with Gollum. Instead, when Gollum is dancing around with the Ring he falls over the edge. I'm not sure if I like this change or not. The Houses of Healing--I wish that Peter Jackson had put this part in the movie, especially after he made such a big deal about Eowyn and Aragorn. It would have given a much better sense of closure. The Scouring of the Shire--This could easily have been put in, especially since the only real reason it's not there is that Peter Jackson didn't like it. And it provides a different aspect of the hobbits. Besides, it's funny. The End--Sam lives in Bag End now, not Bag Shot Row.